How about that street sign? That eye sore is in front of my neighbor's house which means it also sits in front of our house. Translation: it welcomes me home every day. I promise you, smiling at the video camera is not the first thing that comes to mind when I see it. I can even tell you something to make the sign MORE unattractive. A Children at Play sign was removed to put it up. There are currently 11+ children living on our street in addition to a Girls, Inc.! So, I think maybe it wasn't the wisest choice. Unfortunately, I wasn't consulted. 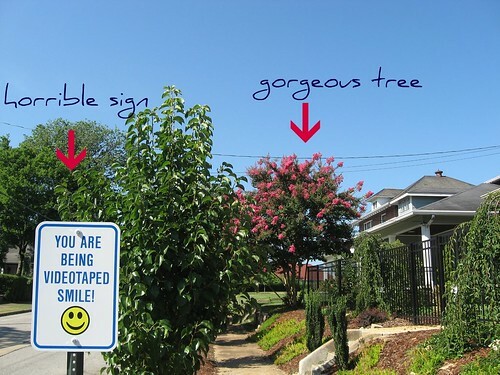 Thankfully, they also have that stunning crepe myrtle that I get to enjoy. Which kind of makes up for it. Just to clarify, the sign is front of this neighbor's house, not this neighbor's house. I'm loving participating in this photo challenge. Have you visited Village yet to enjoy the other participants? The more I see the other pictures the more impressed I am. There are some incredibly talented artists taking part! Hurry, go see.